The marsupial moles are small marsupials found in western Australia. Despite the name the marsupial moles are actually not moles at all and are much more closely related to other marsupial species that are native to Australia. The term mole refers to the marsupial moles life of which is spends the vast majority underground and is adapted perfectly for this life sporting a sleek streamlined body and lacking in eyesight. The preferred habitat of the marsupial moles is that of sand dunes and flat areas of sandy soil usually found along rivers. The marsupial moles have light brown fur and very powerful forearms that are used for tunneling through the sand and soil. Currently the marsupial moles are classed as endangered due to loss of habitat. Despite no being related to the common mole genera the marsupial moles share some of the same physical characteristics and are roughly the same size as a true mole. 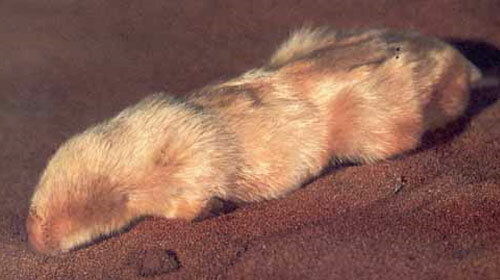 To help with tunneling through sand and soil the marsupial moles has adapted in a number of different ways. The nose of the marsupial mole is well protected with a bone like shield and the vertebrate in the neck connecting the head and back are fused together to provide the marsupial moles with more stability and power when tunneling. The marsupial moles also have no external ears and an backward opening pouch both features help to stop soil and sand getting into areas where the marsupial moles really doesn’t want it. 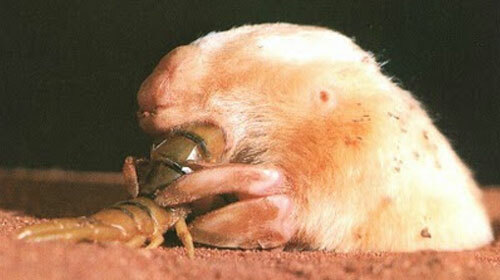 The marsupial moles preferred diet is that of beetles, beetle larvae and pupae. 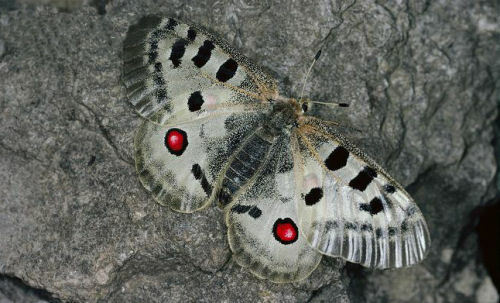 It is believed that the marsupial moles will hunt for food in both daytime and at night and unlike true moles the marsupial moles actually emerge up onto the surface fairly often. Although not much is known about these elusive little creatures it is believed that the marsupial moles breed around November and can have a litter of up to 2 young who immediately move into the mothers pouch.